Tote lavash sandwiches with you on a trip and everyone will drool when you pull one out to eat. You’ll probably get a question or two about where you bought those sandwiches. Not only do lavash sandwiches travel extremely well, but they give you a blank canvas for culinary creativity. For example, we made these sandwiches with what we had on hand, items that would taste good together. Salmon salad is the base. Take a can of good quality salmon, toss in some minced onion, minced garlic, and homemade mayonnaise. Every good lavash has greens. We chose arugula because the peppery bite in arugula sings with the strong flavor of salmon. Black olives add color and avocado adds texture. What we would have added was sliced radishes both for the flavor and the crunch. But alas, that was one item not on hand. You work with what you’ve got! As for the bread itself, you need to use it when it’s fresh – within a day or two of purchase. It dries into a cracker quickly and will not roll. If the bread dries beyond sandwich-making capacity, break it up into bite-sized pieces. Fry it in coconut oil and use as croutons. Trader Joe’s carries lavash, but you better get there early. It sells out fast. Pick it up at an ethnic grocery or bakery. Freshly bagged lavash is soft and super easy to work with. Empty the canned salmon into a mixing bowl. Check for bones. Use the oil in the can. It is loaded with nutrients. Mix in the onion, garlic, and mayonnaise. Use enough mayonnaise to suite your own taste. Adjust for salt and pepper. The salmon salad should be tasty and satisfying on its own. You may want to add more onion, finely chopped celery, or a splash of hot sauce. You are the artist! Lay a sheet of lavash out on a large cutting board. Spread it liberally with your mayo. The mayonnaise helps to keep the bread soft and helps to seal in the juices from the sandwich fillings so the bread will not get soggy. At least, that is the goal. Spread out the arugula leaves on a long half of the lavash. Make this the half that is closest to you. You are going to build your sandwich on top of the arugula. These leaves also help guard the bread from too much moisture. Spread half of the salmon salad over the arugula leaves. The layer is thin. Use a large spoon for spreading. Spread as evenly as possible. Form a line of black olives along the long edge of lavash that is closest to you. This will be the dead center of your lavash roll. Line up the olives so its like one long black tunnel. Lay out the avocado slices on the salmon salad. Carefully roll the lavash, jelly-roll style, with the olives in the center. You want the roll as tight as possible. This is what keeps it together after the pieces are cut. The optimum process is to wrap the salmon sandwich in plastic wrap and pop it into the refrigerator for a couple of hours. This allows the fillings to set into place and stay put better when you slice the roll. Make your second salmon roll in the same manner. If you need to slice and serve the lavash immediately, slice carefully with a very sharp knife. Hold the roll tightly as you slice. Store the sandwiches in an airtight container. Whether they are in the refrigerator or in your lunch box, they dry out fiercely fast. If you are serving them on a platter, fully cover the platter with plastic. Happy travels and happy eating! 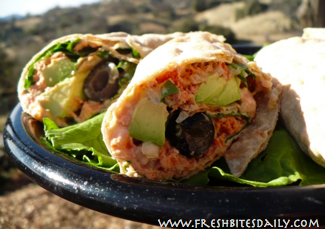 3 Comments on "Some of the best road food around in this salmon wrap"
I enjoy eating sandwich. I used to make canned tuna sandwich, but I haven’t tried canned salmon. I guess canned salmon sandwich will just be as delicious as the former. I will try this recipe.